Birth record data from 2002-2012 (the latest decade available) show a substantial drop in numbers and rates of births across L.A. County. Of the births that occurred, the majority were in the San Gabriel and San Fernando Valleys, and in the South L.A. region. Births to white and Latina mothers decreased countywide by 33% and 19%, respectively, while births to Chinese women rose 146% - this increase was most dramatic in the San Gabriel Valley. Births to women with college degrees increased for the county as a whole, but not in the Metro, South, and East L.A. areas, or in the Antelope Valley. Why do these trends matter? Understanding demographic trends is critical for planning services and systems to meet the changing needs of children and families. Historic service distribution patterns across the county may need to change to meet shifting demographic conditions. Communities with the largest concentrations of young children need the infrastructure and resources to support these families. Decades of research show investments in young children and families pay off. Assuring a healthy start for children should be one of the highest priorities for our county - our future literally depends on it. Why does it matter? Quality health care in the first trimester of pregnancy lowers the risk of complications including low birth weight and premature birth, a leading cause of infant death. Research shows that a healthy birth—followed by safe, nurturing relationships and environments—sets children on a path toward good health into adulthood. This snapshot highlights good news: The vast majority of women in L.A. County reported not smoking during pregnancy or in the three months before conception from 2007-2012 (latest available data from birth records). And perinatal non-smoking rates improved slightly during this period. Data suggest that public health efforts to reduce smoking among expectant mothers—where smoking could have two-generation consequences—seem to be working. All areas of the county saw improvements in perinatal non-smoking as well, though rates differed by region. While the Antelope Valley had the lowest percentage of births without perinatal smoking during 2007-2012, that region also experienced the greatest gains, e.g., figures in Service Planning Area (SPA) 1 rose from 95.5% to 96.5%. Why do these trends matter? Though these increases – in percentage terms – are relatively small, they represent thousands of infants and significant progress for maternal and child health in L.A. County. Perinatal smoking not only harms the mother’s health but also increases the risk of infant death, premature birth, low birthweight, and birth defects, among other complications. These findings indicate that public health efforts to decrease preterm births and improve birth weights appear to be working. As new birth record data become available, they likely will show continued progress given that many new programs and policies have been implemented since 2012. It is critical to maintain these gains and continue prioritizing efforts to promote healthy births in L.A. County, especially now, at a time of change and uncertainty for the nation’s health care system and safety net programs. Why is it important for infants to be born “full-term” (delivered in the 39th or 40th week) and at a “normal weight” (about 5.5-8.8 pounds)? When babies reach full-term, their bodies have a chance to fully develop, including their respiratory, brain, and liver functioning. Preterm birth and low birthweight are leading causes of infant death in the U.S. In addition, infants born too early or too small are at increased risk of serious long-term health problems that can be very challenging for children and families and for society-at-large, resulting in billions of dollars spent each year on health care, special education, and other services. Understanding demographic trends is critical. 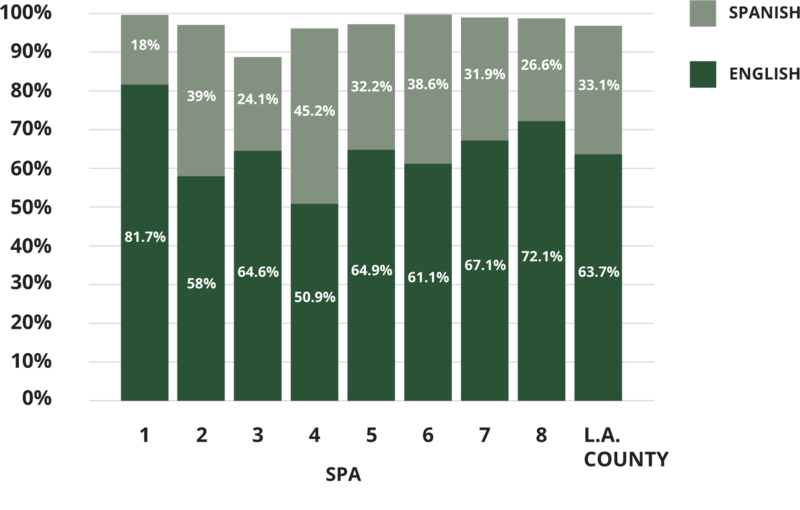 In order to invest appropriately in systems to support children and families throughout L.A. County, we need to understand the differences between demographic characteristics of our population in different parts of the county, including Service Planning Areas (SPAs) and Supervisorial Districts (SDs), and how they have changed over time. Studying demographic shifts is essential for understanding changing service needs, re-examining historical assumptions, tracking the results of changes in service delivery patterns, and guiding resource allocation. For example, examining where babies are born – and the characteristics of families having them – can help service providers, funders, and policymakers understand trends and see how previous policy and programmatic solutions have affected the population as a whole. Examining the demographic trends of families with young children is especially important. Decades of research demonstrate that health and well-being in the early stages of life have profound impacts into adulthood (1). By supporting young children and their families, we are investing in a healthy, thriving future population (1). Recent demographic and economic analyses indicate that assuring a healthy start for our children is even more important to L.A. County’s future prosperity than ever before (2, 3). Overall, data point to a shrinking child population in L.A. County, a retiring baby boom generation, and projected workforce shortages in years to come, making our children and their families an increasingly vital resource (2, 3). Because our county encompasses so many regions with different demographic and economic profiles, this snapshot focuses on key distinctions between communities in different parts of the county, providing a closer look at local conditions that may suggest new approaches to effectively supporting these families and their children. * This snapshot focuses on the latest decade of birth record data available for 2002-2012. This perspective illustrates long-term demographic shifts and a trajectory of change that provides useful context for understanding today’s environment. As subsequent years of data become available, these figures will be updated. Healthy births require healthy parents, homes, and communities — and accessible, high quality health care. Quality prenatal care is comprehensive, culturally sensitive, linguistically appropriate, and client-centered. It is complex because providers must identify and address both medical and non-medical issues that could affect the health of the mother and baby. Non-medical needs might involve nutrition, emotional health, substance use, housing, poverty, or other issues. Quality prenatal care connects patients to needed support services and resources while identifying and resolving potential medical problems and providing guidance on health in general. Increasing access to quality health care in the first trimester of pregnancy is a major public health goal, as it lowers the risk of complications including low birth weight and premature birth, a leading cause of infant death.1 Addressing inequities in access to prenatal care by race/ethnicity, mother’s age, and socioeconomic factors is particularly critical. This snapshot examines trends and regional variation in access to timely prenatal care in L.A. County, drawing on the most recent decade of data available from birth records: 2002-2012. Given that this decade is prior to full implementation of the federal Affordable Care Act (ACA), these data present a pre-ACA picture of prenatal care access in the county. This perspective illustrates long-term trends and a trajectory of change that provides a useful backdrop for understanding today’s evolving health care environment. As new birth record data become available, these data will be updated and analyzed alongside policy and program changes that took place after 2012. Perinatal smoking is one of the most common preventable causes of serious health problems in infants—and even death.1 Cigarette smoking during pregnancy increases the risk of sudden infant death syndrome, preterm birth, fetal growth restriction, and a host of other pregnancy complications.1 And the risk is not limited to flammable cigarettes; other forms of nicotine, such as electronic cigarettes, also can cause problems during pregnancy. Tobacco use among women before pregnancy, as well, can reduce fertility and increase the risk of birth defects.1 These risks are compounded by the harmful effects of smoking on the mother’s own health, including cancer and heart disease. Second-hand smoke is unsafe, too, as it increases health risks for both infants and mothers. This snapshot examines trends and regional variation among L.A. County women who reported not smoking during or in the three months prior to pregnancy, drawing on the most recent data available from birth records: 2007-2012. * This perspective illustrates a trajectory of change that provides useful context for understanding today’s environment. As new birth record data become available, these figures will be updated. Overall, this snapshot highlights progress in L.A. County and suggests that public health efforts to reduce smoking among expectant mothers — where smoking could have two-generation consequences — seem to be working. * As smoking is self-reported, this information likely is less reliable than other information collected on the birth record but is loosely in line with other self-reported data on perinatal smoking, e.g., see Health Indicators for Women in Los Angeles County; Smoking Prevalence and Cessation Before and During Pregnancy: Data From the Birth Certificate, 2014; and MIHA Report 2013-2014. This snapshot looks at births that are both full-term and normal weight, as one important way to gauge healthy births. The data presented here highlight regional and demographic group differences across L.A. County, drawing on the most recent data available from birth records: 2007-2012. This perspective illustrates a trajectory of change that provides a useful backdrop for understanding today’s environment. As new birth record data become available, these figures will be updated. Births declined between 2002 and 2012, overall, and in nearly every region of L.A. County (only Antelope Valley showed a small increase of 6%). 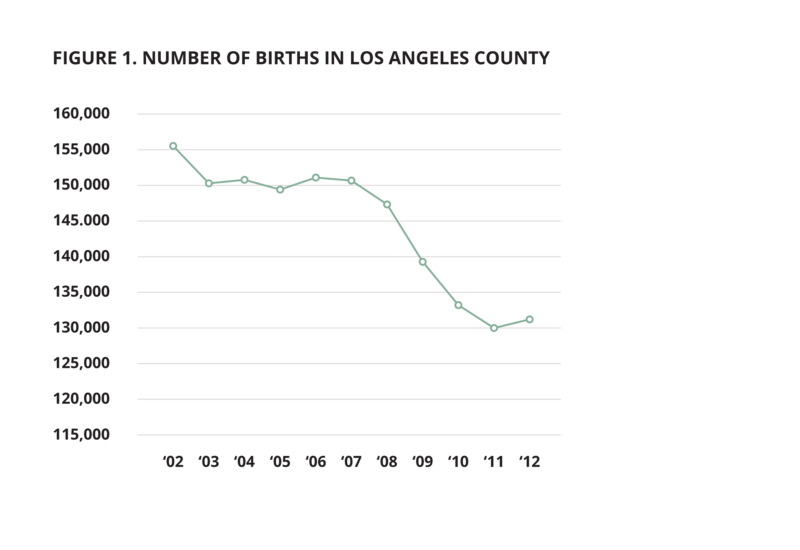 The total number of births in L.A. County decreased by 15% between 2002 to 2012, with an especially sharp drop between 2007 and 2011. Examination of birth trends show differences between regions, as defined in two ways: Service Planning Areas (SPAs) and Supervisorial Districts (SDs)*. Despite the declines, the distribution of births throughout the county has remained fairly consistent, with most births occurring in the San Gabriel and San Fernando Valleys, and in the South L.A. region. For example, of the 131,119 total births in L.A. County in 2012, the majority (59%) occurred in SPAs 2 (San Fernando Valley), 3 (San Gabriel Valley), and 6 (South L.A. area), a pattern consistent with previous years. Among Supervisorial Districts in 2012, more than 75% of births occurred in SD 1 (downtown L.A. to Pomona and Eagle Rock to South Gate), SD 2 (southern L.A. areas down to Carson), and SD 3 (overlaps with SPA 2 in the San Fernando Valley and extends down to Venice and West Hollywood), also similar to prior years. Not surprisingly, fertility rates among women of childbearing age (15-49) declined as well. In a trend consistent with other studies (1, 2), L.A. County’s general fertility rate dropped significantly during 2002-2012, from 66.9 to 57.9 births per 1,000 women ages 15-49. As shown in the map above, rates declined in all SPAs and SDs, with the greatest drops in Metro and South L.A.: SPA 4 (-19%) and SPA 6 (-21%). Data by Supervisorial District also showed the greatest decline in SD 1 (-15%), which covers Metro L.A. down to South Gate and part of the San Gabriel Valley. 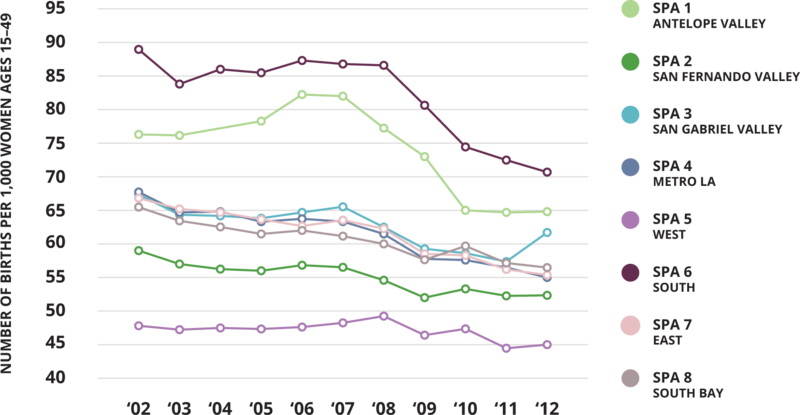 The graphs below show declines over time by SPA and SD, but they also highlight variations in birth rates by region. From 2002 to 2012, SPA 1 (Antelope Valley) and SPA 6 (South L.A. area) consistently had the highest fertility rates, at 64.9 and 70.7 births, respectively, per 1,000 women ages 15-49 in 2012. 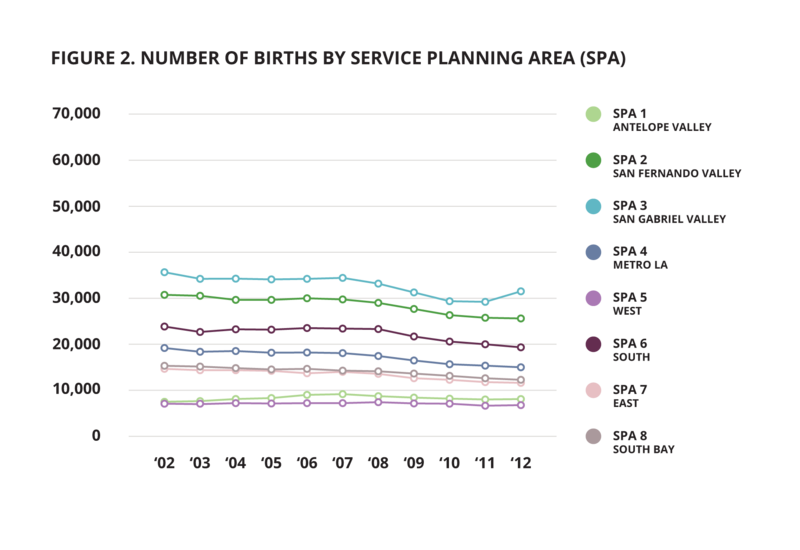 SPA 5 (West L.A. area) had the lowest fertility rate, at 45 per 1,000 in 2012. *The five Supervisorial Districts in L.A. County are defined by electoral district boundaries. Each district’s elected Supervisor is a member of the Board of Supervisors, the governing body for the County. The eight SPAs were created for planning and information sharing purposes, in line with how communities think about their regions. The SPA boundaries were developed through a collaborative process, including focus groups and consultation with community organizations. L.A. County birth records reveal declines in timely prenatal care between 2002 and 2012, countywide and in all regions except the San Fernando Valley. 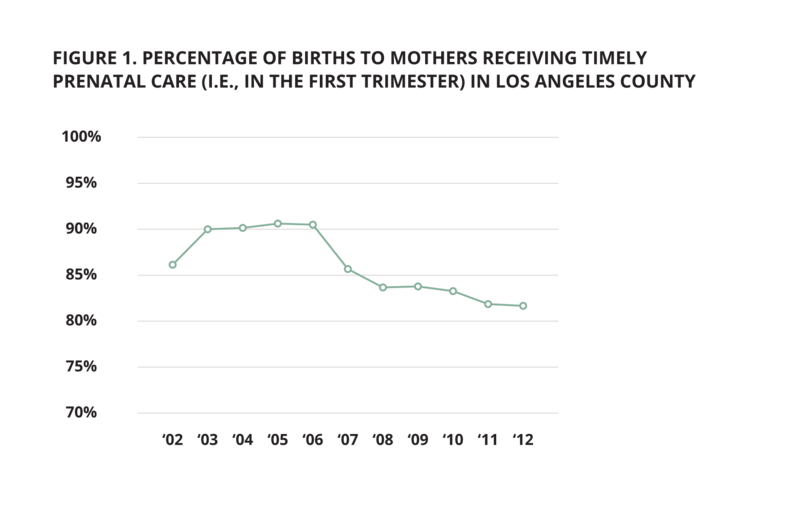 The percentage of L.A. County births to women receiving timely prenatal care increased in the first part of the decade (from 86% to 91%), but dropped sharply after 2006, ending at 82% in 2012. 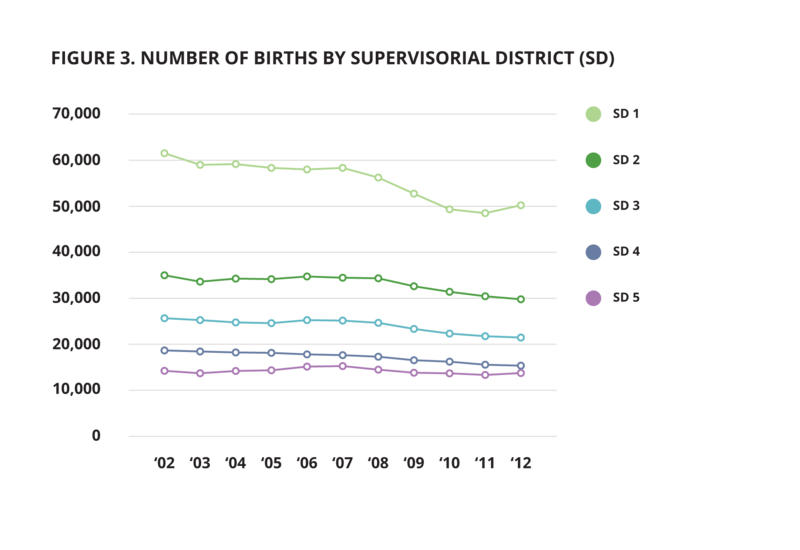 Like the county as a whole, all SPAs and SDs experienced a sharp drop after 2006 in the percentage of infants whose mothers received timely prenatal care. The drop is especially striking as it follows several years of rising percentages (except in the Antelope Valley, which saw declines throughout the decade). As shown in the map above, when comparing the beginning of the decade (2002) to the end (2012), the percentage with access to early prenatal care decreased in every region except the San Fernando Valley, which had a slight increase of 2%. The largest decline was in the Antelope Valley (SPA 1), where the percentage fell from 87% to 72%. Note: See downloadable Excel file on this page for additional prenatal care data by SPA and SD. The county’s health care safety net faced many strains during this decade, especially the second half, that likely contributed to the declines. Such strains involved the closure of several hospitals and clinics, including a clinic in the Antelope Valley. Another impactful closure was that of the Martin Luther King-Harbor Hospital in 2007 (it reopened in 2015), which affected health care services for residents in South L.A. and surrounding areas (SPA 6 and SD 2, in particular). The Great Recession, too, added pressure on service systems during 2007-2012, with rising unemployment and poverty levels,3 and concurrent state and county budget cuts. Local health care experts point to other factors, as well, such as difficulty finding available providers during this time, especially for Medi-Cal patients. Specific program changes also may have played a role, including the California Perinatal Outreach and Education (POE) program ending in the mid 2000s (while some local POE programs remained open with other funding, many closed). In the mid 2000s, Antelope Valley Partners for Health and many other local public and private organizations came together to find ways to increase the availability of primary care services for low-income residents in the region. This effort resulted in opening the Antelope Valley Community Clinic in 2008, which has greatly expanded over the years and is now a Federally Qualified Health Center (FQHC). In 2006, the LA Best Babies Network created the Healthy Births Care Quality Collaborative (now called the Perinatal Health Collaborative of LA), which partners with clinics throughout the county to implement best practices for prenatal and postpartum care. The LA Best Babies Network also created Best Babies Collaboratives in high-need communities, funded by First 5 LA, involving dozens of agencies working together to improve interconception care** (between pregnancies) through coordinated case management, outreach, social support, and health education. In 2009, the Welcome Baby program was piloted through Maternal and Child Health Access in partnership with California Hospital Medical Center to support pregnant and postpartum women and their families. It provides free in-home and in-hospital visits, where trained professionals offer support and information on topics like health care, nutrition, breastfeeding, home safety, and parenting. It has since expanded to 13 L.A. County hospitals. The Comprehensive Perinatal Services Program (CPSP) was revamped and strengthened during this decade. CPSP serves pregnant and postpartum women in Medi-Cal, providing culturally competent health care as well as services related to nutrition, emotional health, and health education. Prior to the Affordable Care Act, CPSP offered benefits not available elsewhere. Experts anticipate that data after 2012 will show improvements in access to timely prenatal care given efforts like those listed above, plus implementation of the Affordable Care Act, the introduction of groundbreaking new strategies such as First 5 LA’s Best Start Communities, economic recovery after the recession, and additional resource allocation to underserved communities. * The five Supervisorial Districts in L.A. County are defined by electoral district boundaries. Each district’s elected Supervisor is a member of the Board of Supervisors, the governing body for the County. The eight SPAs were created for planning and information sharing purposes, in line with how communities think about their regions. The SPA boundaries were developed through a collaborative process, including focus groups and consultation with community organizations. **Recognizing that a healthy pregnancy begins before conception, interconception care focuses on women’s health, including mental health, between pregnancies and encourages women to wait at least 18 months before their next pregnancy to help improve outcomes. This is especially important for women with existing health problems or with a history of pregnancy complications. The vast majority of women in L.A. County reported not smoking during or before pregnancy from 2007 to 2012. In addition, perinatal non-smoking rates improved during this period. Countywide, the percentage of births to mothers who did not smoke during pregnancy or in the three months before conception increased slightly from 98.2% in 2007 to 98.8% in 2012, as shown below. All regions of the county saw increases, as well. As shown in the map above, all SPAs and SDs experienced percentage gains in births to mothers who did not smoke before or during pregnancy from 2007 to 2012, similar to countywide improvements. Figures 2 and 3 show these improvements over time by SPA and SD, but they also highlight variations by region. While the Antelope Valley (SPA 1 and SD 5) consistently had the lowest percentages of perinatal non-smoking, that region experienced the greatest gains, e.g., figures in SPA 1 rose from 95.5% in 2007 to 96.5% in 2012. Several other regions reached levels of 99% or higher by 2012, including the San Fernando Valley, San Gabriel Valley, Metro L.A., and South L.A. areas. Note: See downloadable Excel file on this web page for additional data by SPA. Note: See downloadable Excel file on this web page for additional data by Supervisorial District. While most women reported not smoking before or during pregnancy, and figures generally improved across the board, differences by demographic group persisted. Race/Ethnicity: Of the groups with available data in 2007 and 2012, countywide levels of perinatal non-smoking were lowest among Japanese, African American, and white mothers, though these three groups also saw the greatest gains during this period. For example, the percentage of births to African American women who did not smoke during or before pregnancy improved from 96.0% in 2007 to 97.2% in 2012. Perinatal non-smoking levels were highest among Chinese and Latina mothers, both at 99.4% in 2012. Due to smaller numbers in sub-county regions, data were not available for all racial/ethnic groups by SPA and SD, though available figures showed patterns similar to countywide data, with nearly all groups improving between 2007-2012. These data also demonstrate variation by racial/ethnic group across L.A. County communities. Among African American and white women, for example, Antelope Valley (SPA 1 and SD 5) had the lowest perinatal non-smoking levels in 2012, e.g., about 93% for both groups in SPA 1, compared to 98.4% in SPA 2 (San Fernando Valley). Among Latina women, 2012 perinatal non-smoking levels ranged from 98.7% in SPA 1 to 99.7% in SPA 4 (Metro L.A.) and SPA 6 (South). Births without Paternity Established: In 2007, the countywide percentage of births with no perinatal smoking was 95.1% for those without fathers identified on birth records, compared to 98.4% for those with paternity established. This gap tightened by 2012, to 97.2% and 98.9%, respectively, showing solid gains for infants without fathers identified at birth. Figures improved for both groups in all sub-county regions, but perinatal non-smoking for births without paternity established remained relatively low in the Antelope Valley in 2012: 90.6% in SPA 1 and 90.1% in SD 5. County-level differences in perinatal non-smoking levels by maternal age, education level, and public vs. private insurance were not large, and percentages improved for all groups between 2007-2012, further reducing the small gaps. Note: See downloadable Excel file on this web page for all demographic group data by SPA and SD. 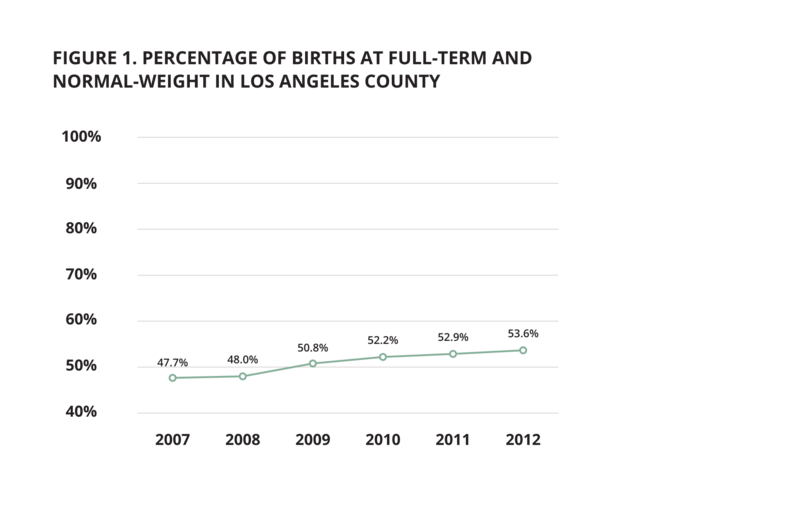 Just over half (53.6%) of L.A. County infants were born full-term and at a normal weight in 2012, up from 47.7% in 2007. All regions of the county improved. As context for these findings, recent decades of data show that L.A. County’s rates of preterm birth and low birthweight have been slightly higher than California as a whole but lower than national levels. Preterm births have declined at the county, state, and national levels since 2007, though the CDC reports a small uptick between 2014 and 2015 in U.S. rates.1, 8 The latest March of Dimes Premature Birth Report Card shows that preterm birth rates are 9.6% for the U.S. and 8.5% for both California and L.A. County (state and national data are for 2015 and county data are for 2014). Similarly, rates of low birthweight generally were on the rise at the county, state, and national levels from the 1990s until the mid 2000s, but largely leveled off with some slight declines since then. Low birthweight rates from the March of Dimes were 8.0% for the U.S., 6.7% for California, and 6.9% for L.A. County in 2014. 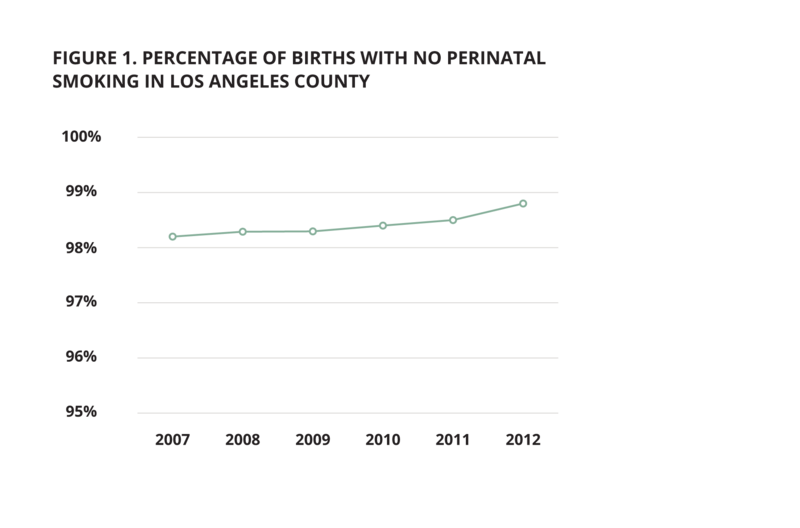 This snapshot describes the percentage of L.A. County births that were both full-term and normal-weight from 2007-2012 (latest available from birth records), by region and demographic group. Countywide, this percentage increased from 47.7% to 53.6% over the five-year period, shown below. As shown in the map above, all SPAs and SDs experienced percentage gains in births that were full-term and normal weight from 2007 to 2012. Figures 2 and 3 below show these changes over time, and they also highlight variations by region. The largest increases occurred in the San Gabriel and San Fernando Valleys, with percentage gains over 19% in SPA 3 and over 17% in SPA 2 and SD 3. The smallest gains were seen in the South and East regions of the county—in SD 4 and SPA 7 (1.7% and 4.7%, respectively), which include many of the same communities, such as Downey, Whittier, Lakewood, Cerritos, and La Mirada. However, SD 4 and SPA 7 also started at higher levels than other regions at the beginning of this period, as shown in the next figures. The percentage changes in births at full-term and normal weight were significant for all regions except SD 4. The changing characteristics of infants born in L.A. County and its sub-county areas suggest that the needs of these areas are shifting, as well. These trends have important implications for service providers and policymakers. 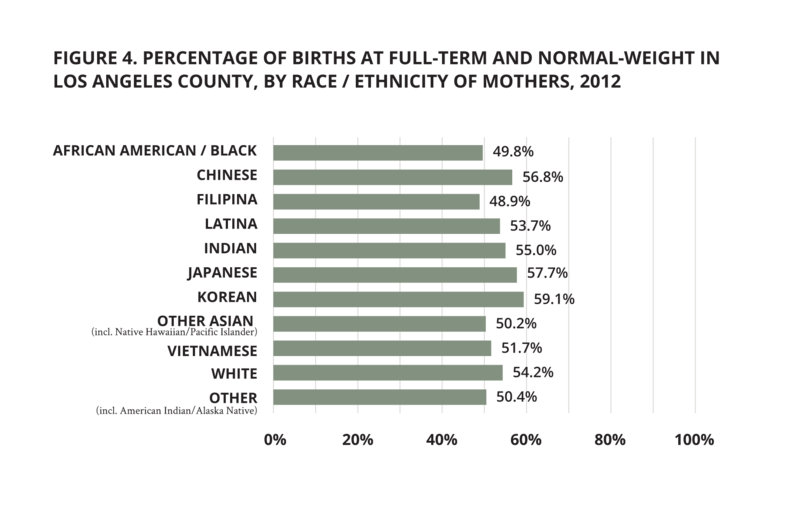 The racial/ethnic landscape among mothers giving birth shifted significantly between 2002 and 2012. Fewer teens gave birth, by number and proportion. Children born to teens are at higher risk of premature birth, low birth weight, and other adverse health, behavioral, and social outcomes (3). Teen mothers and fathers, too, may face additional challenges as young parents, such as financial hardship and difficulty finishing their education (3). In a trend echoed by other local, state, and national research (1, 2), the number of infants born to teen moms in L.A. County decreased substantially by 44% over the decade between 2002 and 2012. In 2012, births to teen moms made up only 4.1% of all births in L.A. County, down from previous years. All sub-county regions showed declines, as well, with the greatest reductions in the San Fernando Valley and West L.A. areas (SD 3 and SPAs 2 and 5), and in the South Bay (SD 4 and SPA 8). Although older women may be in a better financial position to have children relative to younger mothers, births to women over age 40 involve increased health risks for both mom and baby (2). Data show the opposite pattern for this group, with births to mothers age 40 and older rising 13% countywide during this decade. This pattern was evident in most parts of L.A. County, except areas east and south of L.A., which showed a different trend. 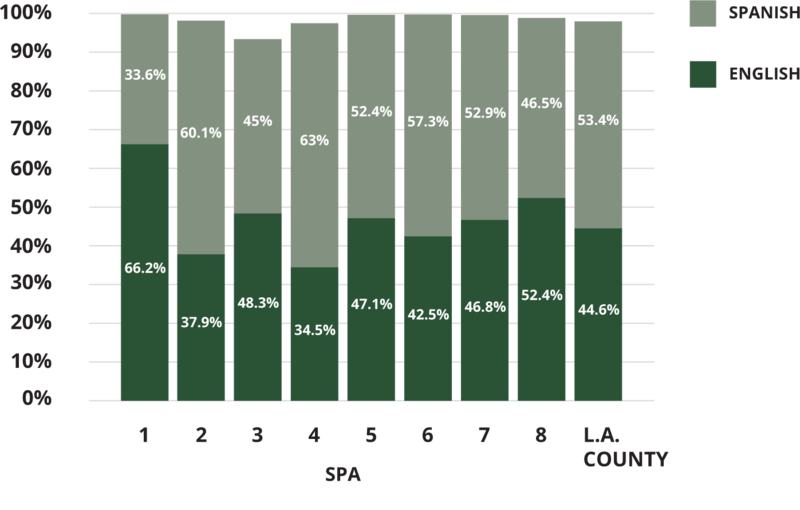 Data from SPAs 6 (South) and 7 (East) showed decreases of 33% and 17%, respectively, in infants born to moms age 40 and over, while SD 1 (downtown L.A. to Pomona) also showed a decrease of 6%. The vast majority – 92% – of births listed fathers on birth records in 2002 and 2012. Fathers and other parental figures can have a profound, positive influence on children’s development, from the prenatal stage throughout children’s lives (4). Establishment of paternity at birth highlights the relationship between father and child, and the father’s intention to remain engaged in his child’s life. It may also serve as a proxy measure for family stability and financial resources, with the absence of an identified second parent potentially indicating increased family vulnerability. The lack of an identified second parent may signal, too, an increased likelihood there will be unrelated parental partners in the child’s life. 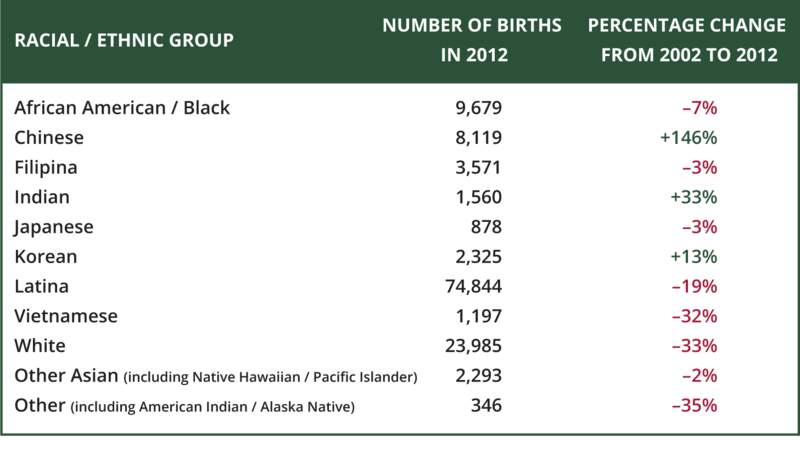 In both 2002 and 2012, fathers were listed on births records for the great majority, 92%, of infants born in L.A. County. All regions of the county showed similarly steady figures, hovering around 90% during the decade. Recognizing that births dropped countywide in this timeframe, the number of infants with fathers identified on birth records also declined overall and in every region except for Antelope Valley (SPA 1), which showed a small increase of 2%. Maternal education levels increased for the county as a whole, but not for all regions. Maternal education is a major factor that influences child health and well-being. For example, research indicates that as parental levels of education increase, children’s health, behavior, and academic achievement also improve (5). 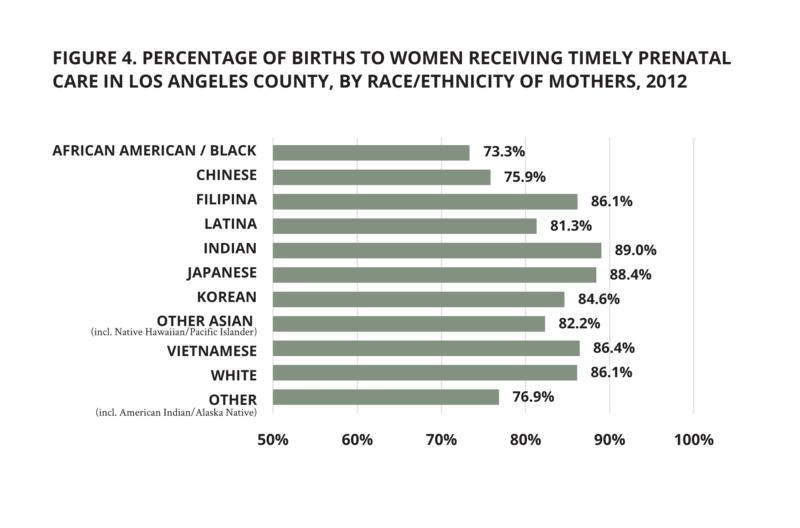 As shown in the figure below, L.A. County birth records reveal shifts in maternal education levels, with increasing numbers of infants whose mothers had completed college and decreasing numbers of infants whose mothers had not completed high school. This trend has been reflected in other county data analyses, too, such as analysis of education levels for participants in the Special Supplemental Nutrition Program for Women, Infants, and Children (WIC). The percentage of births covered by public insurance remained steady – just over 50%. The number of births funded by public health insurance is one way to gauge the economic circumstances of families with new babies. This data set covers changes in the period between 2002 and 2012, as noted, which was prior to full implementation of the federal Affordable Care Act. As new birth record data become available, these data will be updated and analyzed alongside policy and program changes that took place after 2012. Just over half of all L.A. County births were funded by public insurance in both 2002 and 2012. In line with the significant countywide drop in births during this period, the number of births funded by both public and private insurance also declined. But trends at the sub-county level varied. All regions showed declines in the number of publicly-funded births except for the South L.A. area (SD 2 and SPA 6) and Antelope Valley (SPA 1), which showed increases. SPA 6 (South) also had the highest proportion of publicly-funded births of all regions in 2012: 78%, up from 51% in 2002. 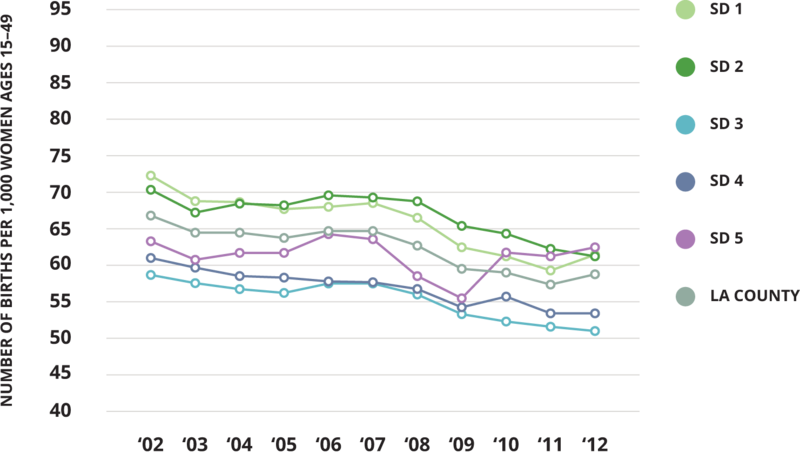 SPA 5 (West), on the other hand, had the lowest proportion in 2012: 32%, compared to 51% in 2002. New 2016 WIC data by SPA signal shifts in languages spoken among low-income families with young children. Data from the Special Supplemental Nutrition Program for Women, Infants, and Children (WIC) provide additional insight into the circumstances of L.A. County’s low-income population. WIC is a major public health program and a critical part of the safety net for families in need. It provides healthful food, nutrition education, breastfeeding support, and referrals to needed services for low-income (below 185% of federal poverty level) pregnant and postpartum women, and children up to age 5. In L.A. County alone, WIC served more than 330,000 children and 85,000 women in 2016, reaching a substantial portion of the county’s low-income families (6). In fact, WIC serves approximately 60% of all children under age 5 in L.A. County (6, 7). The following table shows the total number of women and children served by WIC in each SPA in 2016. (Data are not available by Supervisorial District. See the downloadable Excel file below for additional WIC data by SPA for 2006-2016.) While WIC is reaching thousands of struggling families throughout the county, the South L.A. area (SPA 6) was home to the greatest number (84,841) and percentage (20%) of individuals served in 2016, similar to previous years. In addition, the San Fernando Valley (SPA 2), San Gabriel Valley (SPA 3), East L.A. area (SPA 7), and South Bay (SPA 8) each had more than 60,000 WIC participants in 2016 and prior years. Source: PHFE WIC Data Mining Project, L.A. County WIC Data, 2016. See the downloadable Excel file on this web page for additional 2006-2016 data run by Service Planning Area for this report. WIC data also shed light on changing demographics across the county, including languages spoken in low-income households. 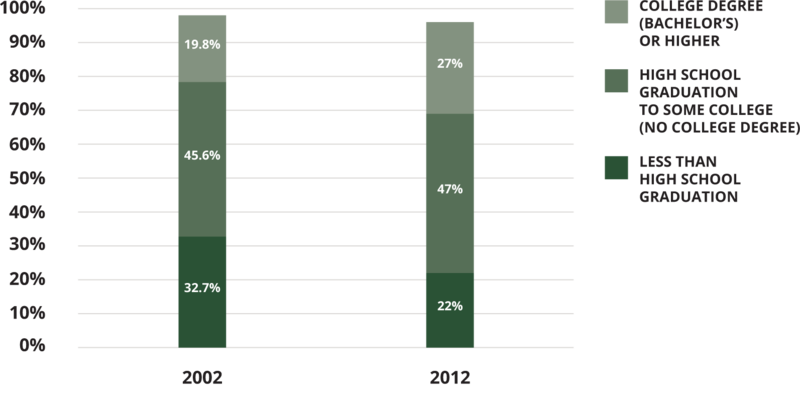 For many years, nearly all WIC participants have indicated their preferred language is either English or Spanish; however, the percentage preferring Spanish has been on the decline over the past decade, as depicted below. Source: PHFE WIC Data Mining Project, L.A. County WIC Data, 2006-2016. Analysis run by Service Planning Area for this report. See the downloadable Excel file on this web page for additional data. 6. PHFE WIC Data Mining Project, L.A. County WIC Data. (2016). See the downloadable Excel file on this web page for additional 2006-2016 data by Service Planning Area prepared for this report. While timely receipt of prenatal care decreased countywide for almost all racial/ethnic groups between 2002 and 2012, declines were statistically significant for African American, Chinese, Korean, Latina, and white mothers. Timely prenatal care also was less likely for births to teens, mothers with lower education levels, and mothers with public insurance, as well as births where paternity was not established. Prenatal care is an especially important source of support for teen mothers, though these young moms are much less likely than older women to receive it.4,6 While receipt of timely prenatal care declined for mothers of all ages in L.A. County (and in nearly all sub-county regions) during 2002-2012, only 64.7% of births to teen moms involved timely prenatal care in 2012, compared to 85.1% for births to mothers ages 30-39. Among regions within the county in 2012, timely prenatal care for teen births was lowest in the Antelope Valley (48.9% in SPA 1 and 50.3% in SD 5) and highest in the San Fernando Valley and West L.A. areas (about 74% in SPA 2 and SD 3). Recognizing that income levels tend to rise with education levels, it is not surprising that births funded by public insurance—one way to gauge family income level—were less likely to receive timely prenatal care than those with private insurance: 78.6% vs. 85.2%, respectively, in LA. County in 2012. This disparity was true for nearly all regions of the county during this decade, even though access to early prenatal care declined for privately insured births, too. Data also show consistent, large disparities across the county in access to timely prenatal care by whether or not fathers are listed on the birth records, e.g., in L.A. County, 83% of births with paternity established received early prenatal care, compared to 66.4% for births without paternity established in 2012. Note: See downloadable Excel file on this web page for additional demographic group data and findings by SPA and SD. At the local level, while small numbers in some cases make it difficult to determine trends, the percentage of infants born full-term and normal weight increased for most racial/ethnic groups in the majority of SPAs and SDs. Notably, figures for African American, Latina, Chinese, and Japanese mothers improved in every region with available data. Consistent with other research, mothers age 40+ were less likely than younger moms to have full-term, normal-weight births in L.A. County during 2007-2012, though women over 40 experienced the largest gains in this time period of any demographic group at the county level, from 39.9% to 48.8%.1, 11 Figures also improved for teen moms age 19 or younger, from 51.3% to 56.6%. Mothers ages 20-29 and 30-39 saw improvements, too (up to 55.1% and 52.7%, respectively, in 2012). Data by SPA and SD generally followed these countywide patterns. There were no substantial differences between levels of maternal education, public/private insurance status, or paternity establishment in the percentage of births at full-term and normal weight. All of these demographic sub-groups improved at the county level from percentages in the high 40s in 2007 to the low 50s in 2012. While the birth rate is down overall, there are still significant differences between the regions of L.A. County in terms of the numbers of newborns and the circumstances faced by their families. They matter because services to support young children and their families are not distributed based on need – and it is likely that historic distribution patterns have not changed to meet shifting demographic conditions. They matter because the programs that are recognized as being particularly effective in supporting families and preparing children for healthy, productive lives are not always readily available or accessible in communities where families need them most. These include home visiting and high quality early care and education programs (1, 2, 3). They matter because many of the county's service systems are still oriented to routine processing of service requests or managing cases. They are not as helpful as they need to be in helping families negotiate institutional silos or connecting them to community-based services that can help prevent later problems or intervene early when warning signs appear. Service providers may not appreciate the extent to which children are becoming an even more important resource for L.A., and may not be prepared to address the special needs and circumstances of parents with young children. They matter because the building blocks for lifelong health and wellness are set in the earliest years of childhood through relationships with parents and caregivers. Helping parents and supporting them to make the most of these early years should be one of the highest priorities for our county – our future literally depends on it. But local efforts to promote healthy birth outcomes must be sustained, strengthened, and expanded, particularly in light of the current national policy context and an evolving health care system. Local efforts also need to be aligned to fill gaps so that residents have the information and support they need to make the most of what is available through our complex service systems. We must keep striving to ensure that all populations, particularly those at greatest risk of poor pregnancy outcomes,* have continuous, accessible, and affordable high-quality health care coverage and services near their homes. We need to continue promoting the health of reproductive-age women before pregnancy. This means having a regular source of health care, where pregnancy risk factors such as obesity or cardiac issues can be addressed. We also must continue working toward a comprehensive approach to health care for both women and men that includes family planning and contraception education, with adequate insurance reimbursement. Having a regular source of care will help ensure, too, that once a woman becomes pregnant, she receives early prenatal care and is connected to appropriate services and a birthing hospital/center as close to her home as possible. Without these connections, women may not receive care until critical problems or ER visits occur, and they may have to wait for approval of services or go through last-minute transfers from one location to another—all of which could have life-threatening consequences. Overall, reducing inequities in access to health care and improving pregnancy outcomes in L.A. County will not involve any single solution, organization, program, or policy. It will require the continued commitment of leaders and organizations working across sectors to strengthen the network of services available in every community. At a time of uncertainty for health care programs and systems at the federal level, this continued focus is more important than ever. Overall, data show positive trends, with most women abstaining from smoking prior to or during pregnancy and figures improving during 2007-2012. Given that percentages generally were in the high 90’s at the start of this period, increases – in percentage terms – were small but represent significant progress for maternal and child health in L.A. County. A 2017 report on women’s health from the Los Angeles County Department of Public Health indicates that overall rates of smoking among women have continued to improve in recent years.5 Public health efforts to reduce smoking in L.A. County seem to be working. For many years, service providers and health care professionals throughout L.A. County have been incorporating tobacco cessation efforts into programs serving pregnant women and new moms, such as Welcome Baby, Black Infant Health, and Nurse-Family Partnership, which offer wide-ranging support services, home visits, health education, and referrals to needed services. It is vital to maintain and expand these types of services and to ensure that tobacco cessation remains an intentional program focus. One of the most promising strategies to reduce perinatal smoking, though, is to address it in the health care setting before women become pregnant.6, 7, 8 Primary care (and prenatal care) providers can assess tobacco use, provide intervention options, and offer referrals to services. Since second-hand smoke is harmful, too, tobacco screening and referral services should be part of regular health care for men of reproductive age as well. According to CDPH, approximately 40% of reproductive-age women report that they have not been advised by their doctor to stop smoking.6 The Affordable Care Act currently requires health insurance providers, including Medi-Cal, to cover comprehensive tobacco cessation services for pregnant women. It is critical to preserve these benefits, particularly given the uncertain future of the nation’s health care system. In addition, L.A. County has benefited enormously from First 5 LA, which has invested over $1 billion in services and systems to support families with young children (prenatal to age 5) using funds from California’s Proposition 10 tobacco tax. It is worth noting that while recent decreases in smoking are good news, this also means reduced tobacco tax revenues to support public health efforts. Although L.A. County has made clear strides in reducing perinatal smoking, further reductions are needed, and certain groups and communities continue to be at increased risk of adverse birth outcomes. Concerted efforts are needed to strengthen and better align the complex network of services available throughout the county, so that gaps are filled and families are able to navigate the system and receive tobacco cessation support or other needed services. * As described in the Key Findings section of this snapshot and in other research, e.g., see references 4 and 6. However, differences by region and demographic group remain, and there is considerable room to improve L.A. County’s 53.6% of infants born full-term and at a normal weight. We must not only maintain the recent gains, but also continue striving toward new progress and increased equity among demographic groups. This is especially important at a time of change and uncertainty for the nation’s health care system and safety net programs. L.A. County organizations can continue pursuing these strategies while leveraging state and national momentum and resources. The March of Dimes and others also are engaged in broader efforts to reduce preterm births, including: expanding research on prevention and treatment options; improving clinical practice; promoting health equity in recognition of long-standing racial/ethnic and socioeconomic disparities; and increasing public awareness about the urgent need to reduce preterm births. Preconception and interconception health are essential. It is well established that healthy pregnancies begin before conception. Long-term, sustained advances in birth outcomes will require improving the health of all reproductive-age women – and men, too. Women need access to affordable, culturally appropriate, high-quality health care and support services addressing non-medical issues when and where they need it. This is particularly critical for populations at higher risk of adverse birth outcomes, e.g., low-income, women of color, teens, women age 40+, women with past pregnancy complications, women carrying more than one baby, and women with health, mental health, or substance use issues. Infant health affects lifelong health. Investments in young children are investments in our future population. Healthy children require healthy families and communities. To support young families, leaders need to understand who they are, where they live, and the needs they face. This series provided insight into those questions. Historic service distribution patterns across the county may need to change to meet shifting needs and demographic conditions. Communities with the largest concentrations of young children need the infrastructure and resources to support these families. Reducing inequities in birth outcomes and improving healthy births overall in L.A. County will require continued cross-sector collaboration to strengthen, expand, and align service systems to fill gaps and help families navigate the complex network of services across the county. We extend our sincere thanks to the following individuals for sharing their time, advice, and insights, which were instrumental in shaping this snapshot. Additional thanks go to Shannon Whaley and Catherine Martinez of PHFE WIC for doing a special run of WIC data by SPA for this report, as well as to Beau MacDonald of the Geospatial Sciences Institute at the Dana and David Dornsife College of Letters, Arts and Sciences, USC, for calculating population zip code estimates for this analysis. We are also deeply grateful to Pegah Faed, Armando Jimenez, and the entire First 5 LA team for funding this project and providing invaluable support and guidance every step of the way. Finally, we thank Barbara Needell whose thoughtful feedback helped to strengthen the report. We also thank Jed Ostrom, David Weiner, and the team at Next Interactives for building and designing this web page, as well as Rose Bridges for the graphic design of the PDF provided here, and John Braun for seamless integration and hosting on the CDN website. We extend our sincere thanks to the following individuals for sharing their time, advice, and insights, which were instrumental in shaping this snapshot series. Finally, we thank Barbara Needell whose thoughtful feedback helped to strengthen this series. We also thank Jed Ostrom, David Weiner, and the team at Next Interactives for building and designing this web page, as well as Rose Bridges for the graphic design of the PDF provided here, and John Braun for seamless integration and hosting on the CDN website. 5. The American College of Obstetricians and Gynecologists Committee on Obstetric Practice Society for Maternal-Fetal Medicine. (2015). Definition of term pregnancy. Committee Opinion No. 579. Retrieved from: http://www.acog.org/Resources-And-Publications/Committee-Opinions/Committee-on-Obstetric-Practice/Definition-of-Term-Pregnancy. This snapshot is part of the ongoing "Connecting the Dots" series by the Children's Data Network at the USC Suzanne Dworak-Peck School of Social Work. Connecting the Dots snapshots bring together data and stories to provide new insights about the health and well-being of children and families in L.A. County. The series also highlights the great work happening throughout the county. This is the first of four snapshots to be released in 2017, drawing on data from birth records to examine regional differences within L.A. County. This snapshot provides an overview of infant and family demographic trends as a foundation for the next three snapshots, which will explore specific indicators of healthy birth outcomes, such as receipt of timely prenatal care. This is the third of four snapshots to be released in 2017, drawing on data from birth records to examine regional differences in births and healthy birth indicators within L.A. County. The four snapshot topics are Birth Trends, Timely Prenatal Care, Perinatal Smoking, and Full-Term & Normal-Weight Births. As noted, this is the fourth and final snapshot in the 2017 series, drawing on data from birth records to examine regional differences in births and healthy birth indicators across L.A. County. The four snapshots covered Birth Trends, Timely Prenatal Care, Perinatal Smoking, and Full-Term & Normal-Weight Births. Data Definition: Percentage change in General Fertility Rate—number of births per 1,000 women ages 15-49—from 2002 to 2012, by Service Planning Area (SPA) and Supervisorial District (SD) in Los Angeles County. Source: Vital Records, 2002-2012. Analysis by the Children’s Data Network at the USC Suzanne Dworak-Peck School of Social Work, University of Southern California. Population estimates for denominators retrieved from the California Department of Finance (http://www.dof.ca.gov/Forecasting/Demographics/Estimates/) and U.S. Census Bureau, American Community Survey (https://factfinder.census.gov/faces/nav/jsf/pages/index.xhtml). Zip code estimates calculated by the Spatial Sciences Institute at the Dana and David Dornsife College of Letters, Arts and Sciences. Footnotes: Changes in fertility rates between 2002 and 2012 were statistically significant for L.A. County, all Supervisorial Districts, and all SPAs except 1 and 5. Population denominators for women ages 15-49 in each geographic area are synthetic zip code estimates based on city estimates from the California Department of Finance and U.S. Census Bureau. 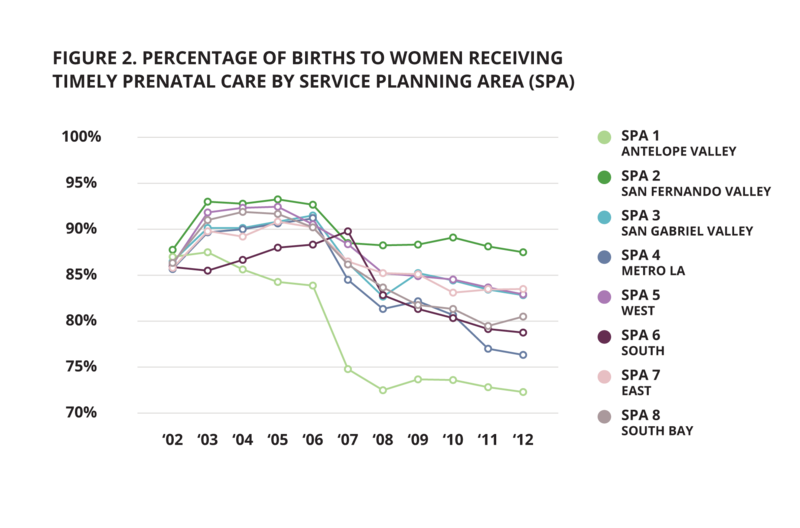 Data Definition: Percentage change in births to mothers receiving timely prenatal care (i.e., in the first trimester) from 2002 to 2012 by Service Planning Area (SPA) and Supervisorial District (SD) in Los Angeles County. Source: Vital Records, 2002-2012. Analysis by the Children’s Data Network at the USC Suzanne Dworak-Peck School of Social Work. 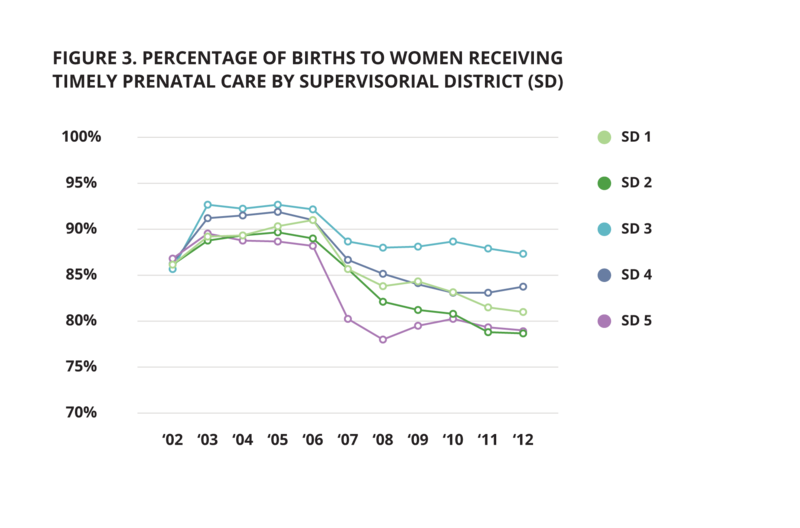 Footnotes: Changes in the percentage of births to women receiving timely prenatal care between 2002 and 2012 were statistically significant for L.A. County, all SPAs, and all SDs. Data Definition: Percentage change in births to mothers who reported not smoking during pregnancy or in the three months prior to conception from 2007 to 2012, by Service Planning Area (SPA) and Supervisorial District (SD) in Los Angeles County. Footnotes: Changes in the percentage of births with no perinatal smoking between 2007 and 2012 were statistically significant for L.A. County, all SPAs, and all SDs. As smoking is self-reported, this information likely is less reliable than other information collected on the birth record but is loosely in line with other self-reported data on perinatal smoking, e.g., see Health Indicators for Women in Los Angeles County; Smoking Prevalence and Cessation Before and During Pregnancy: Data From the Birth Certificate, 2014; and MIHA Report 2013-2014. 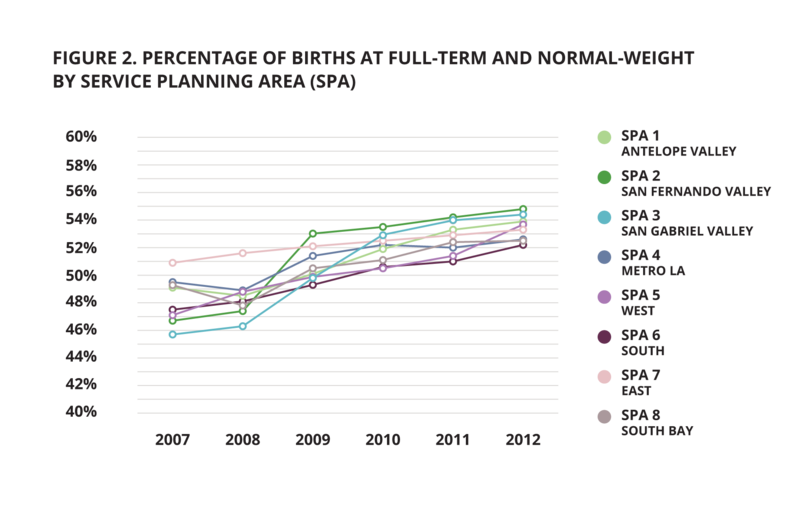 Data Definition: Percentage change in births at full-term and normal weight from 2007 to 2012, by Service Planning Area (SPA) and Supervisorial District (SD) in Los Angeles County. Footnotes: Changes in the percentage of births at full-term and normal weight between 2007 and 2012 were statistically significant for L.A. County, all SPAs, and all SDs except for SD 4.